IBM (NYSE: IBM) and Libelium, a wireless sensor network hardware provider, today released an Internet of Things Starter Kit to enable dozens of sensor applications ranging from monitoring parking spaces or air pollution to providing assistance for the elderly. Created by IBM scientists and Libelium engineers to ease application development, testing, and scalability of wireless sensor networks (WSN), the new Internet of Things Starter Kit integrates Libelium’s Waspmote wireless sensor platform with IBM’s Mote Runner software and 6LoWPAN, which allows every single sensor and device to connect directly to the Internet using the new IPv6 protocol. IBM Mote Runner is an open software development platform that connects sensor and actuator motes within wireless sensor networks based on the IETF 6LoWPAN protocol specification. 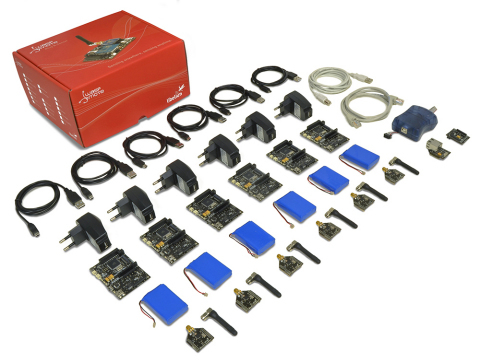 With the new Internet of Things Starter Kit, a real-time operating system is integrated in Libelium Waspmote nodes to support more that 60 different sensors available "off the shelf," allowing developers to easily build any application on top. The Internet of Things SDK also includes the source code of the 6LoWPAN libraries so that researchers can modify and add their own algorithms and improvements. "We have worked closely with IBM to offer a development platform that can be used for both simulation and real IPv6 sensor connectivity," said David Gascón, CTO at Libelium. "This platform is a powerful tool for improving and testing 6LoWPAN capabilities in the context of wireless sensor networks and the Internet of Things." The development environment of IBM Mote Runner comprises a complete tool chain to develop applications in high-level object-oriented languages such as Java and C#, providing support for source-level debugging and network simulations to ease application development and testing. Its web-based deployment and monitoring framework, in concert with edge and backend servers, make IBM Mote Runner an end-to-end-solution for the development, deployment, integration and visualization of wireless embedded applications. As from now, IBM Mote Runner further provides a 6LoWPAN protocol implementation for IPv6 connectivity. A key feature of the Waspmote platform is its remarkable energy efficiency, crucial to wireless sensor networks: Waspmote counts with a sleep mode of 65uA allowing years of battery life. Other features include refinements to the hardware platform and a set of more than 60 ready-to-use sensors and actuators for a broad set of applications. Waspmote’s modular approach to radio technology allows the choice of any of the six radio protocols available—including Wi-Fi, ZigBee, 802.15.4, Bluetooth, NFC, 3G—or to switch between any two of these technologies if needed.